The action was pretty fantastic on Saturday. The movement up and down the field, goalkeepers diving, and the midfield action was captivating. Whatcom Community College hosted Shoreline Community College in women’s and men’s soccer on Saturday afternoon October 4, 2014, in Bellingham, Wash. Shoreline defeated both teams. Whatcom woman lost 2 to 0, and the men lost via a last-minute goal 1 to 0. 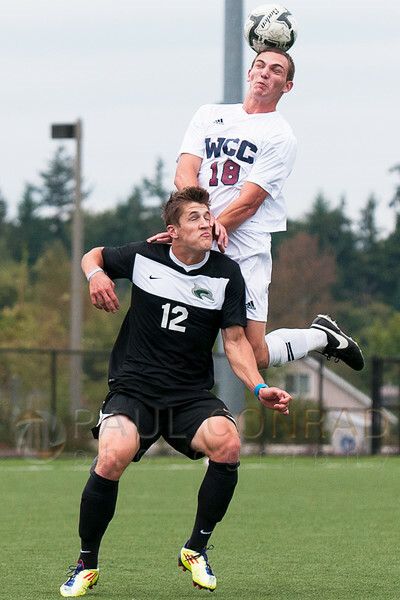 © Paul Conrad/The Bellingham Herald – WCC freshman forward Canyon Silliman (18) goes above SCC freshmen defensive man Ryan Anderson (12) during the first half on Orca Field at Whatcom Community College in Bellingham, Wash., on Saturday afternoon Oct. 4, 2014. The visiting Shoreline Dolphins defeated the WCC Orcas 1 to 0 by a last-minute second half goal. 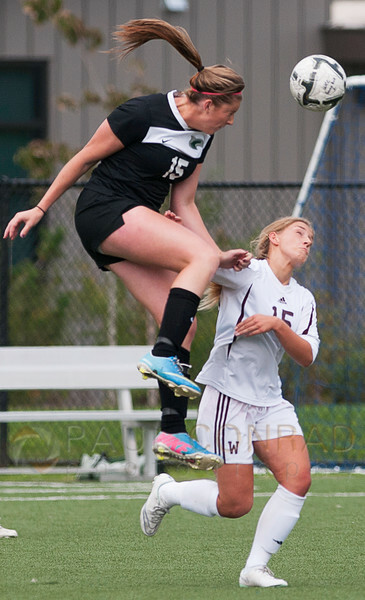 Photographing soccer can be fun and challenging. There may be a lot of action, but if you don’t pay attention, you could easily miss the game winning play or score. Having patience and anticipating moments will also help you get better shots. 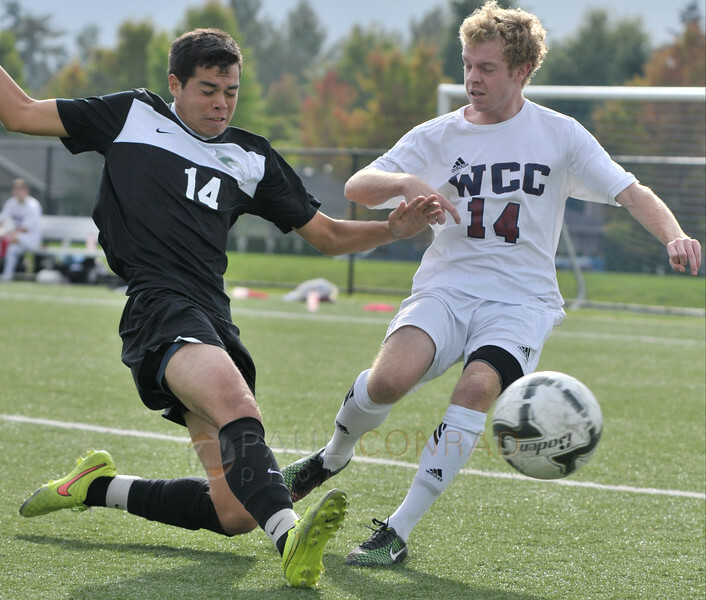 © Paul Conrad/The Bellingham Herald – Shoreline Community College defensive man Andres Lepe (14), left, steals the ball from WCC forward Conlon Kiffney during the second half on Orca Field at Whatcom Community College in Bellingham, Wash., on Saturday afternoon Oct. 4, 2014. 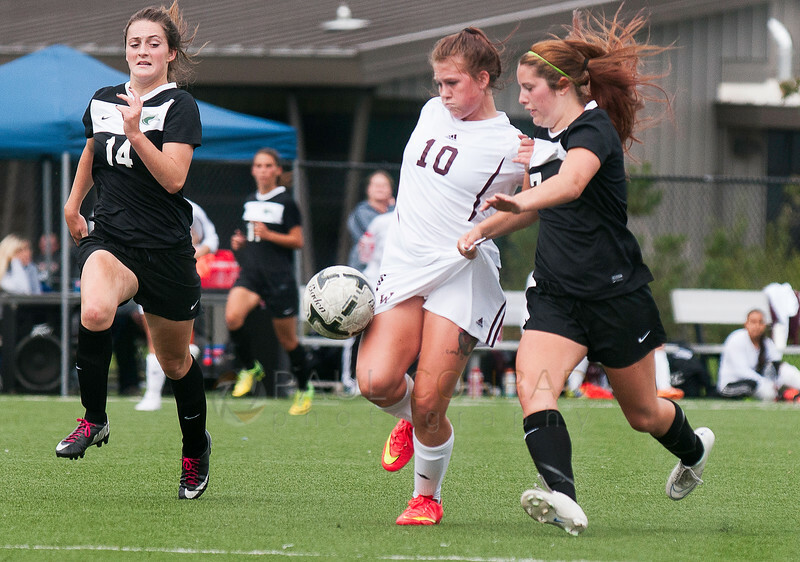 Shoreline defeated Whatcom 1 to 0 with a last-minute goal. Observe the players – Watch while you shoot how the players from opposing teams pair up. Especially at the goals. Your best action will come from the two as they battle for the ball. Placement – Where you decide to shoot from is important. You’ll capture the best facial expressions when opposing team players battle for the ball as they are coming towards you. Staying midfield the entire game will get you some good action, but spend 10 minutes midfield observing which team is the stronger. Head to the Goal – Once you figure out who is the stronger team, head to the goal where they will be scoring. Stay to the left or right about 15 feet. This gives you good action as the opposing team approaches the goal as well as puts you in position for corner kicks. Corner Kicks – Get yourself between the corner where the ball will be kicked from and the goal. That way the players are looking towards the ball as it approaches. This gives you good facial expressions as the teams battle for the ball. 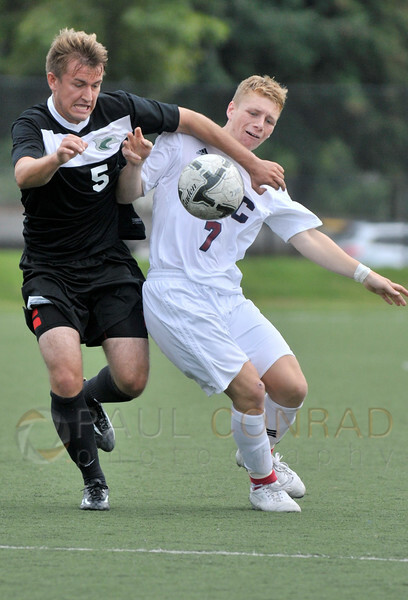 © Paul Conrad/The Bellingham Herald – SCC defensive man Konstantin Reutov (5) and WCC midfielder Emile Diffley (7) battle for the ball during the second half. These two paired up most of the game. Be Fluid – Be prepared to move as the game progresses. For example, the dominate team may be overcome by smart play from the other team. You may have to switch goals partway through the half. Offense vs Defense – Spend some time shooting both. From midfield you can get the defense as they protect their goal. The offense can be shot from the goal as they attempts to score. © Paul Conrad/The Bellingham Herald – SCC forward Hayley Warren (15), left, goes over WCC defensive man Emily Russell (15) during the first half. SCC defeated WCC with 2 second half goals 2 to 0. Don’t worry about missing shots – Seriously, getting stressed over shots you missed is just a waste of energy. Be patient. You’ll get your shots. Like being on the wrong end of the field when one of the teams scores. It happens. Stay on your knees – Keeping low will make it easier to get faces as they’re looking down at the ball. Plus, if you happen to get a player falling, it’ll be easier to keep focused on the face. Yes, people fall pretty hard. Even I did when I played. 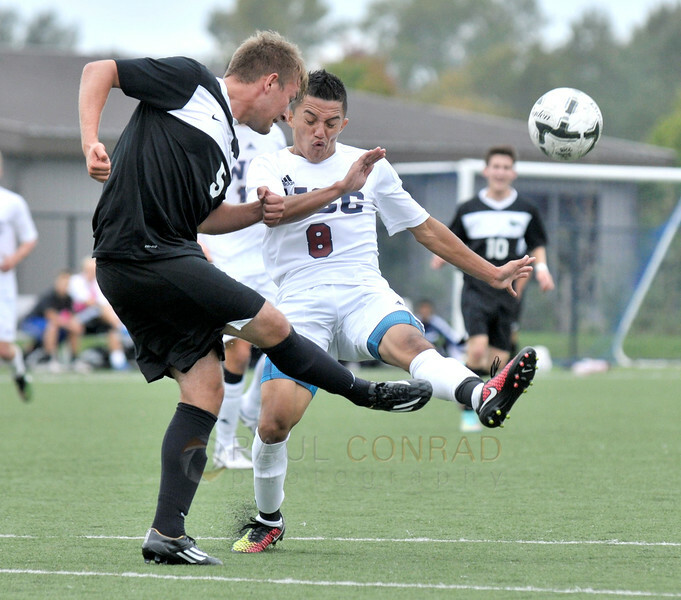 © Paul Conrad/The Bellingham Herald – SCC defensiveman Konstantin Reutov (5) boots the ball from WCC forward Tomas Alvarado during the second half at Orcas Field at Whatcom Community College in Bellingham, Wash. The visiting Shoreline Dolphins defeated the WCC Orcas 1 to 0 with a last minute goal. Lenses – Long glass isn’t truly essential. But a 70-210 is enough if you stay near the goals and have patience. You can even use that lens as you photograph from midfield and wait for the action to come to you. Some photographers even mount remote cameras with wide-angle lenses in the goals. But for the most part, a 70-210 is works well. Keep extra cards handy – This may seem like a no brainer, but I’ve actually run into photographers that have to delete images because they filled their cards. As they do so, they miss shots. Also, change them before they are full. The more images on a card, the slower the camera writes to it as it has to find space. Don’t Rely On The Motor Drive. ANTICIPATE the peak moment and begin shooting just before the peak then follow through. Remember, the action is fast. If you rely on the quick shutter to capture that moment when the ball is on a player’s head, then you are more than likely to miss it. Anticipate that moment and start firing when the moment begins. It takes a lot of practice, but once you learn the shutter lag of your camera (the time the shutter trips once you press the button) and practice, you’ll begin getting those shots. Paul is a Seattle based photojournalist specializing in news, sports, feature, travel, and portraiture. He also photographs weddings and portraits in Bellingham, Whatcom County, and Skagit County. Wow. The expressions on those faces are fantastic and I am a particular fan of flying ponytails. Have you ever talked about post-processing at your site? It seems your turn around time is short, so I’m guessing you must have a simple workflow. Thank you BJ. I’m going to write a few file organization and importing/workflow blogs in the next few days. I’ll email you when I do.